Our Junkers United team has been at it again, turning old junk into funky, unique decor and useful things. This time our focus is on FALL! If your a new visitor – WELCOME! I’m Angie, the author behind the old stuff here at Knick of Time and owner of the Knick of Time online market. ~and get my free printable Antique Graphics HERE. You can also find me on Facebook, Pinterest, Google+, Hometalk & Twitter. To kick off our FALL party, I wanted to create something really easy and inexpensive that could be used throughout the year. I picked up this pair of worn denim overalls at a thrift store. I love overalls and had they fit me, I’d be wearing them right now, but they were mens’ bibs so they were destined for something new. This couldn’t be an easier project! All you need is some old overalls (even child-size ones will work), E6000 or other strong glue, and some clothespins. I cut off the top of the overalls, just below the pocket (save the leftover denim for other projects! ), flipped them over and ran a bead of glue along the BACK inside edges of the overalls and across the bottom edge, then clipped the clothespins on to hold it in place until it dried. It’s important to put the glue on the inside edge of the back because the back is smaller than the front part of the bib. I tucked a canning jar inside the bib opening to hold some fall mums, then gathered up some other vintage items to tuck behind it and put in the pockets. You could use this in place of a wreath and change it with the seasons, but it would make a wonderful wall pocket to hold pens, paper, scissors, etc. over a desk or in a child’s room. Hang it by your couch to hold your remote controls! There are so many ways to use it and it is so easy and inexpensive to make. 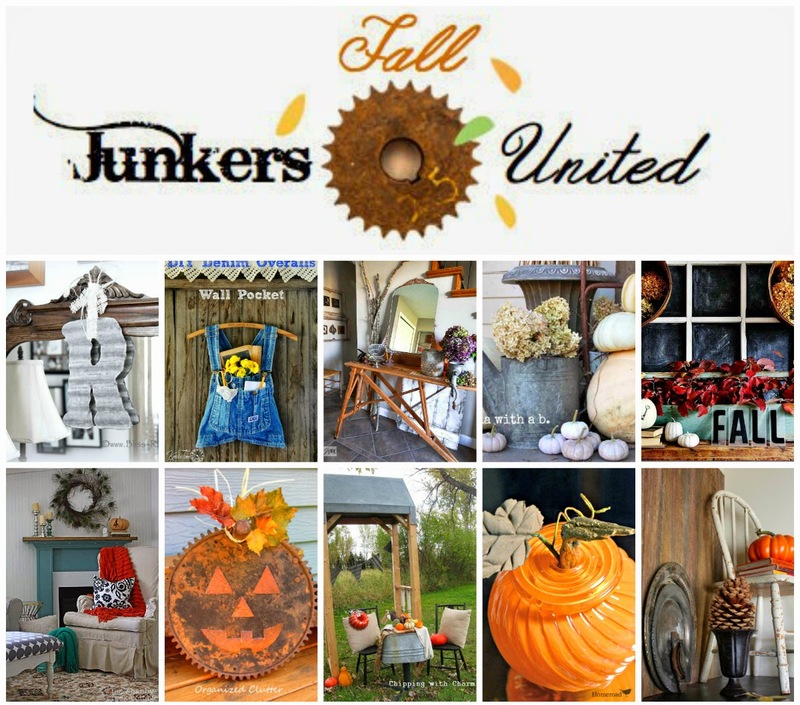 Our team of junkers has grown to 10 gals, and we each have a new fall-inspired project to share, so click on each name to see each amazing project (remember to link up your own project below first)! If you missed our first Junkers United party,you can see what I made for it HERE. I so love this project! I’d LOVE to make one just to hang my clothespins in! Super sweet fall display, Angie! Super cute project. You are definitely on a roll! My grandpa wore that same brand overalls every single day. Maybe it was a farmer thing. Maybe it was a southern thing. I dunno. But every memory I have of him, he’s wearing overalls. This really tugs at my heart strings… makes me really miss him. I absolutely love it! Dang, i should have kept all of those overalls from the early 90’s! I will be on the lookout for them now at thrift stores. What a cute idea! Love the styling and the pop of color! Thanks for the inspiration! I really feel I need to make one of these for myself. It’s so stinking adorable! Really cute Angie … love how you are re-purposing clothes to useful decorative items. I am sure you will find creative ways to use the rest of the overalls. How cute is that?? You have me looking at old clothes in a whole new way Angie! How do I subscribe to your blog? My email is bebekennedy30@gmail com . Thank you.